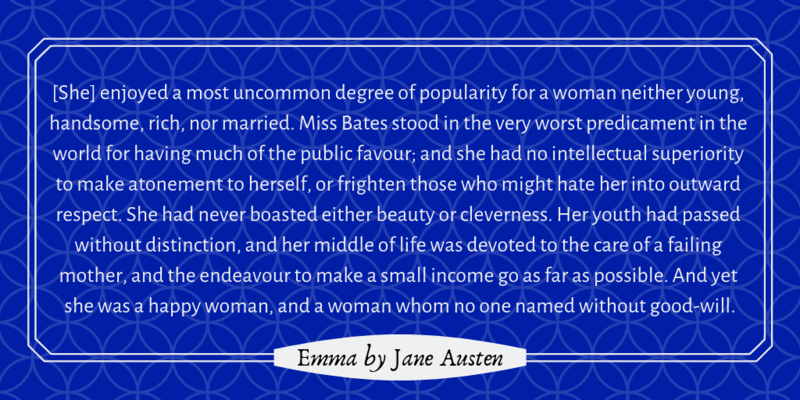 Continuing in the Cooperative Principle and how to break it, we turn our attention to a literary example of rampant unintentional violations: Miss Bates from Jane Austen’s Emma. Miss Hetty Bates lives in Highbury, a frequent associate of Emma Woodhouse. The novel describes her in frank terms. So she’s a middle-aged spinster, plain in appearance and impoverished in purse. Miss Bates is a fundamentally good woman. She would never hurt a fly. And yet, conversationally, she violates the Cooperative Principle on every level. Quantity: She regularly gives more information than anyone wants. Quality: She speaks her assumptions, whether they’re true or not. Manner: She rattles off her information without letting others get in a word edgewise. Relevance: She routinely goes off-topic. ­Manner: She insults Miss Bates in the form of a jest. ­Quantity: She shouldn’t have said an insult at all (and she knows it). Miss Bates doesn’t immediately catch the slight, but when she does, she becomes so flustered and embarrassed that she leaves the group as soon as she can afterward. Emma recollected, blushed, was sorry, but tried to laugh it off. The event serves as a wake-up call. Emma realizes that she has a responsibility to treat her friends and neighbors with kindness. Her higher wealth and privilege comes not because of any merit on her part, but because of her good fortune to be born to it. In short, everyone except Miss Bates is hiding something. The crux of the scene, the insult, leads to the breakup of the party and our heroine’s greater enlightenment. Miss Bates unintentionally violates the Cooperative Principle, but so also do Emma and her sympathetic narrator. They have both portrayed this honest, well-meaning woman as a contemptible nuisance when no one else in the neighborhood judges her that harshly. And that’s the grand surprise: Miss Bates is a silly foil for a silly girl whose worldview is so often wrong, and so often mistaken as correct. Any reader who allows Emma and the narrator to guide their opinion has a rude awakening alongside them both. Miss Bates, good and well-meaning as she is, provides a perfect example of a character who unintentionally violates the Cooperative Principle. She also provides a standard for this type of break on our other layers of dialogue. Consider your current Work in Progress. Now, imagine that Miss Bates is your narrator. Did you wince? You should have.